This article in the Nation reminisces about how much Angkor has changed in the last 10 years, having seen a tenfold increase in visitors from 1998 to 2008. One thing’s for sure, one can no longer take those romanticised pictures of temple ruins sitting quietly in the jungle. A dozen years ago there was no need to get up before dawn to make sure you could walk among the Angkor temples in splendid loneliness. There was no jostling for the best shots of the ruins at dusk. The ancient complex was all but empty throughout the day, save for a few intrepid adventurers – and clusters of local people, mostly children, who tried to reel in riel from the visitors, or better, US dollars, in exchange for batik fabrics, T-shirts and all-purpose krama scarves. 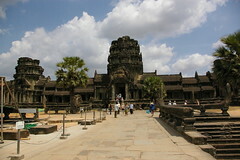 Nowadays, thanks to the peace that came to Cambodia in 1998, visitors complain that the temples are despairingly overrun. Angkor may well be victim to it’s own success, so it’s very important as visitors to leave as little an ecological footprint as possible: conserve water, don’t litter, and support local businesses! Previous Post: Getting a feel for museums – literally! Next Post: You mean the Hobbit’s a clown now?